How often does one post a blog? In my last one, I'd said that I was going to be more diligent about blogging. It's been two months since the last one. Is that often enough? Anyway, I have been busy creating minis. Not much else to do when the weather outside has been as frightful as it has been. In that spirit, one of the things that I'd been working on was to develop a kit for my mini club for snowshoes. It's an ironic project because at the time it was suggested to me, winter was far away. By the time, my teaching session was imminent, everyone in general was heartily tired of the seemingly never ending series of storms we've been experiencing. It's one of my favourite things to do, figuring out how to make a particular project. I must say though, this is one of the more challenging projects I've ever attempted. In the end, I'm pretty please with the result. I'm not so sure if the members of my club feel the same way! To make this project, I determined early that using actual wood to make the frames was not going to be possible. I found cloth covered floral wire which I could paint to simulate wood. It was 16 gauge or so, just stiff enough to hold its shape but easy enough to bend by hand, keeping in mind that my club members had four hours to complete this project. I had also added a mukluk kit to accompany this kit but in retrospect, I should have saved that for another time. More on that later. I then glued two small pieces of wood crosswise near the toe and near the tail. Using artificial sinew from Tandy Leather was perfect as it was easy to work with and simulates the rawhide that is used in real snowshoes. I split the sinew in thirds, which is quite easy to do. It has a natural tendency to do so. Although the weaving doesn't accurately depict full-scale snowshoe construction, it is close enough, I feel. It was difficult enough to figure out the pattern. I used knots to secure the sinew. I'm not sure of the actual name of the knot, but I was calling them lark's head knots. I'm not sure if it's the right name. Anyway, I started at the toe and after a few prototypes, I documented the pattern and wove and knotted my way until the toe was filled. I then did the heel, which was much easier. The middle section was a little more complicated but it turned out to be not bad, once I fell into my stride. I have to say, I was pleased with the results. The hard part is getting the two snowshoes matching! For the bindings, I used soft leather from old jacket. I kept that part simple, just two strips of leather, really, for each shoe. One was wider than the other. I made a wire figure 8 buckle for the narrow strap, the part that goes around the mukluk. The bindings get glued onto the snowshoe just behind the toe hole. 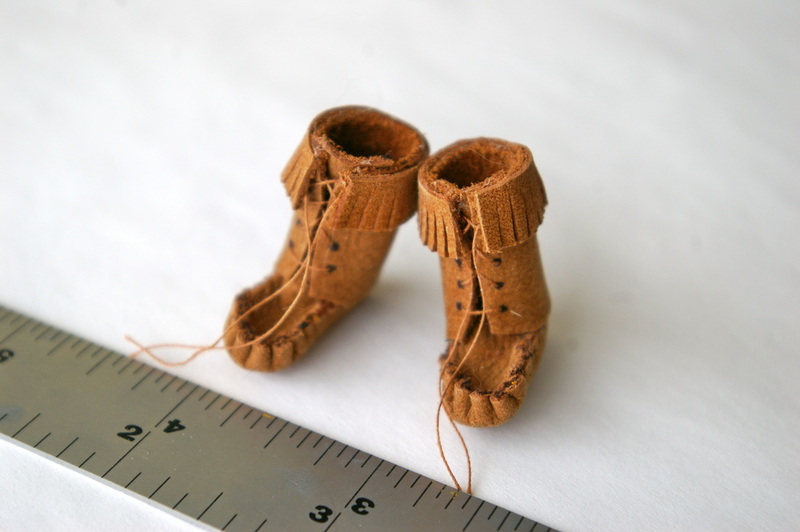 Speaking of mukluks, that was a much easier project but as I said, I should have presented that project on a different day. Most club members made the mukluks and never got around to finishing the snowshoes, so I have no idea how difficult it was for them. I feel a little guilty about that. I used the same leather as the bindings as it was easy to stitch and glue. There are really three parts to the mukluk, the sole, the tongue and the leg. Sewing, as opposed to gluing, works the best in the first part. First, the heel gets sewn and then flipped so that the sewing is on the inside. The sole gets sewn onto the toe and tongue section because you have to ease in the toe part. It's too difficult to glue this part, much to the chagrin of my club mates. The top leg section can be glued on and then the laces can be added. The finishing touch is to glue a small strip of fur to the top. Alternatively, I made a leather fringe and glued that onto a second pair. 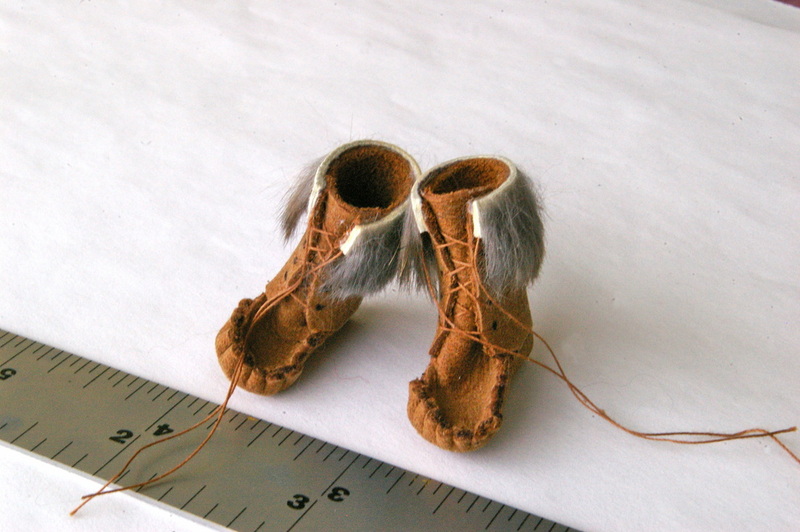 Here is the semi-finished setting for the mukluks and snowshoes. This is the lamp project from Camp Mini Ha Ha 2014. I still have to figure out how to put snow/frost on the windows. By the way, the figure skates is also a project I developed on my own. Well, it's a new year and time for knuckling down and doing something. I have decided to be more diligent about posting and promoting my mini creations. My latest mini project is a little garden which came about quite by accident. It started when our Dartmouth mini club had gone from a two hour bimonthly meeting to a four hour monthly meeting. Which means that we can make more involved projects that might actually get completed! Our last meeting, just before Christmas, was a garden themed one and we had the choice of picking which garden themed items we wanted to make. At a previous meeting there was a wishing well as a project so I decided to create the garden and incorporate the wishing well into it. I also had a substantial collection of paper flower kits leftover from a Camp Mini Ha Ha project that I had decided not to build, so I made them up and put them into my 9" x 9" garden. The base is made from that lovely pink builders' foam we all love so much. I put a second layer of foam over the base layer and carved it so that there was a little path and the wishing well was perched up in the corner at the end of the path. I dug out several flattish shale bits out of my own driveway to make steps leading up to the wishing well and also to the pond in the other corner. The pond was a mini project from my very first Camp Mini Ha Ha (2008) where we learned how to pour resin into a specially prepared blister pack. It was about time I used it. I also had in my possession a little ceramic doll that I believe my great great aunt had found in her garden. It was missing a few limbs but it made the perfect garden statue. I placed it near the well so that it would have some support. I had a lot of landscaping materials from Camp Tidbits and from my own stash. I had made a diorama a couple of years ago for the agricultural college so I had plenty. Planting the flowers was the most fun, deciding where they should go so that there was an even distribution of colour. The birdbath was one I'd made but it had suffered a fall and was chipped in two places. I hated to throw it out as it was such a lovely colour. I found two little white birds so I painted them to look like chickadees and glued them right over the chipped areas so only I and whoever reads this blog will ever know! The bird house I'd made some years ago, based on a real one I'd had. The fence is made from coffee stirrers, being the perfect width and thickness. All I had to do was cut them to length and point the ends for the pickets. It surrounds two sides of the garden with a hedge making up the third side. Since I've made the garden, some creatures have taken up residence in the garden. If you look very carefully, you will find a snail and some worms that I'd gotten as Tidbits from a previous Camp Mini Ha Ha. They were made by Elizabeth Read and this project was perfect for it. My mother, who has developed an eye for finding objects suitable for minis (I call her my enabler!) gave me two turtle earrings. I think they are made from polymer clay so they found their way into my garden via the pond. A butterfly, made from stickers I'd gotten a long time ago flew in and perched on one of the flowers. You never know if other critters will drop by in the future and check out the garden! I realised that after I'd completed this project, that it did not cost me much money to make it. The flower kits, I suppose would've been some money but I'd gotten them as part of the Camp experience so I didn't count that. So it is possible to create a mini scene without spending an arm and a leg. Well, it's been a long while but I'm almost done building the pottery shop and studio. It's amazing what a deadline will do to spur action. Not that I didn't want to finish the project, far from it, but when it's something for myself, it's easy to push it to the back burner where it gets overlooked. The reason I wanted to finish it is twofold. One is so that I can display it at the Shearwater Hobby show coming up in about three weeks and the other is so that I can display it at the Guild School where I've won a scholarship to study there in June. It's also a wonderful way to display all the pottery pieces that I saved just for myself. I even put in my very earliest pieces and it's astounding to see the difference between then and now. I had meant to post the intermediary steps to completing this project but though I did post them to Facebook, I didn't do it here. There's only so much one can do. Completing the other two sides with the cursed egg carton stones was a chore and a half and it's something I won't be doing again anytime soon. My fingers were so sore from tearing up cardboard. A blind sample was used to do the vertical siding on the dormer. I ran out of material so that allowed a "design opportunity" below the window. This I filled in with a mosaic of broken pottery bits, to scale of course! I added a base to accommodate the exterior stair so it made sense to wrap it around the front where I put in a step for the front door and seeing as I had them, I placed three stoneware planters under the window. Here is the latest incarnation of the exterior. I used conte pencil to add some dimension to the cedar shakes. I had to build the working window in the dormer from scratch. I'm not particularly skilled at weathering but I made an attempt at it with the mossy stonework and bits of greenery coming up through the cobblestones. They were made of egg cartons as well but this time scissors was the tool of choice. Under the stairs was the perfect place to put the garbage cans which are candy containers, yeah, that's why I bought them, not for the candy! Most of the exterior is done. It's just a matter of adding signage mostly (which I just found--I'd put it in a "safe place"). The interior was surprisingly quick. 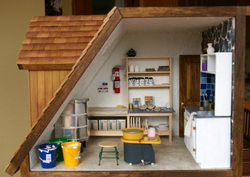 I had an article that Joanne Swanson had written with a tutorial on building a pottery studio so I used it to create some of the items in the studio including the kiln and the potter's wheel. The rest I had to adjust to fit my small space. Though it's not entirely complete, it's mostly there. The glaze buckets were made from coffee creamers which I filled with coloured plaster to simulate glaze. Wouldn't it be nice if the creamers had lids? I'll have to improvise something. Printies that I made myself of the clay boxes, pottery books and posters were done with Photoshop. There is even a book on making miniature pottery in there! Downstairs in the shop, furnishings were easy. The white units were Gifties I'd received at Camp Mini Ha Ha years before and now finally I have a chance to use them. The table in the middle was another Giftie from the last Camp which was made by a talented miniature artisan, Shelley Acker. The door was yet another Giftie from the last Camp, a door stained and embellished with stained glass by gifted artisan Iris Sutherland. All these pieces were perfect to show off the various bits of pottery I've created over the years. Then the walls seemed a bit bare, so I made individual half moon shelves to showcase my very favourite pieces. There is even room for some future pieces! This a landmark occasion in my miniature "career". I actually finished a room box. I mean, finished, as in I will not be adding or changing anything else in it ever again. It helps to have a deadline, in this case, Christmas Day. And then I gave it away to ensure that my hands will never again sneak inside and shift something or add some little tidbit I came across that would "complete" the box. This particular room I created for my mother for Christmas. An avid crafter and sewer, among other talents, this box reflected all her interests or as many as I could fit in the small space I had. The box itself was one of the projects from Camp Mini Ha Ha 2011. It was supposed to have been a kitchen but I, as I am wont to do, decided otherwise. I did use some of the techniques that were taught at that Camp, such as using tissue paper and paint to create a plastered look on the walls and ceiling. For the floor, I glued down slats of wood from a woven wood blind sample and then sanded it down until I tired of sanding. Not my favourite thing to do. The hutch and table were kits designed by the talented Samm Brockhurst and I did only minimal adjustments to make them suitable for what I wanted. I added shelves to the table to transform it into a workbench with "wicker" storage baskets below. I am fortunate to have access to blind samples with the perfect texture to make these baskets. 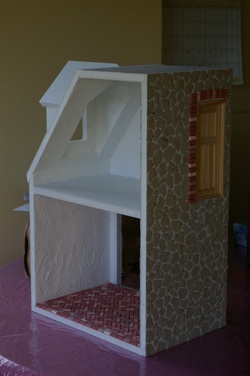 The only thing I did to the hutch was to shape the upper overhand and the sides and to add a door. 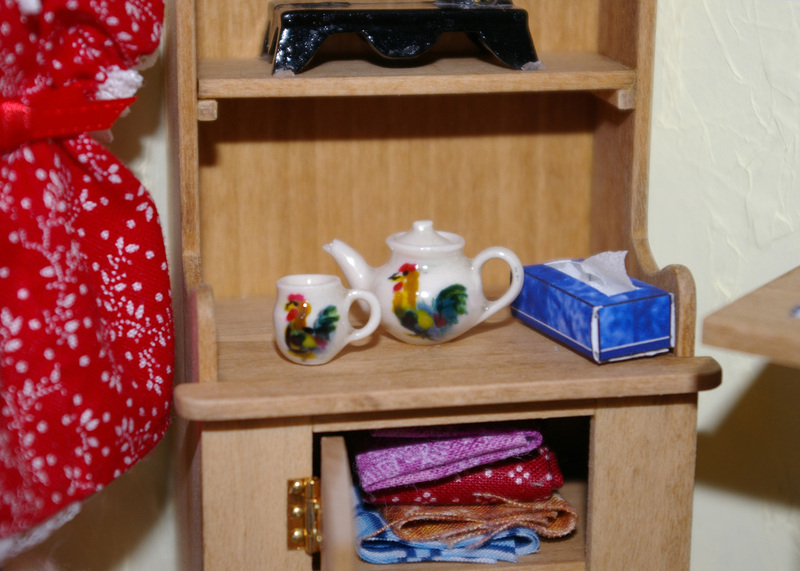 The bookshelf was a kit and the magazine rack and little dress at left were projects done at a mini club night. Some of the items I'd had since I was a little girl, the copper pot full of yarn balls and knitting needles as well as the stool made from the wire thingie from a wine bottle, made by my childish hands. Most of the books I had full size versions of, so I meticulously scanned each one of them, printed and assembled them into perfect replicas of the real ones. Except they don't open. I'd decided that was going too far to have them actually open. Besides, the books would not be able to stay on the shelf well had they been able to. The spool rack I designed and built, a fragile thing that met with a few catastrophes along the way. I thought it was safe once it had been glued to the wall but it had to thwart me one last time when my hand hit it, trying to glue something else. Arggghh! Porcelain teapot and mug for my mom. I had hoped to complete two finished rooms but alas, that was not to be. It was a bit ambitious, I supposed, given my habit of not finishing things. The room box for my dad reflected his interests in music. 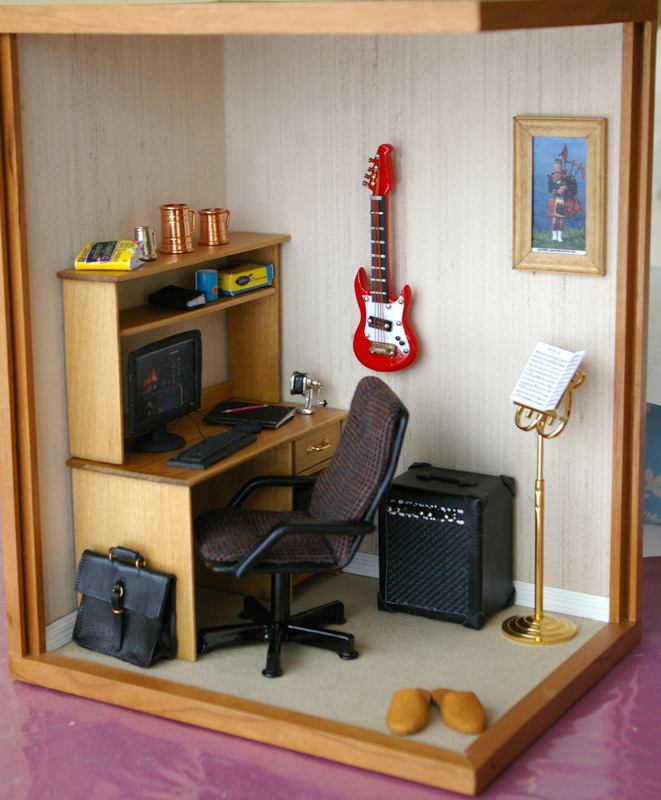 The room itself is another creation by Samm B, only it was supposed to be a 1:24 scale box. I turned it on end and made it into a small 1:12 scale box. There was just enough room to fit a 2" x 4" desk in there, a purchased chair and some musical accoutrements. Running out of time, I settled for a purchased bass guitar though I do have an acoustic guitar under construction. It will have to wait until next year. In actuality, my dad has about five guitars. I did make the amp from a piece of styrofoam, more blind samples and some leather. He used to play the bagpipes too which is why the piper is framed on the wall. With my dad being a space enthusiast, I had to include his computer with the screen set to the NASA homepage. I searched high and low to find a modern computer that resembed his and could not. So I made one from black Fimo. Music room for my dad--as yet unfinished. This box is a little sparce at the moment but I have plans to include more items. I would like to include some military memorabilia to acknowledge my dad's military service. Of course, the other guitar and possibly another one will also make its way into this room, along with some other musical instruments that my dad has had occasion to play. Both room boxes were well received though in both cases, they were much neater than the rooms I was attempting to eumlate! But that's the beauty of miniatures. You can create the room of your dreams, regardless of reality! This is my very first blog post. I've been told it's a good thing to have but honestly, I've had a bit of a mental block about it for some time now. Do people really care about what I think or what I do? I guess time will tell. I've been a miniaturist from way back. 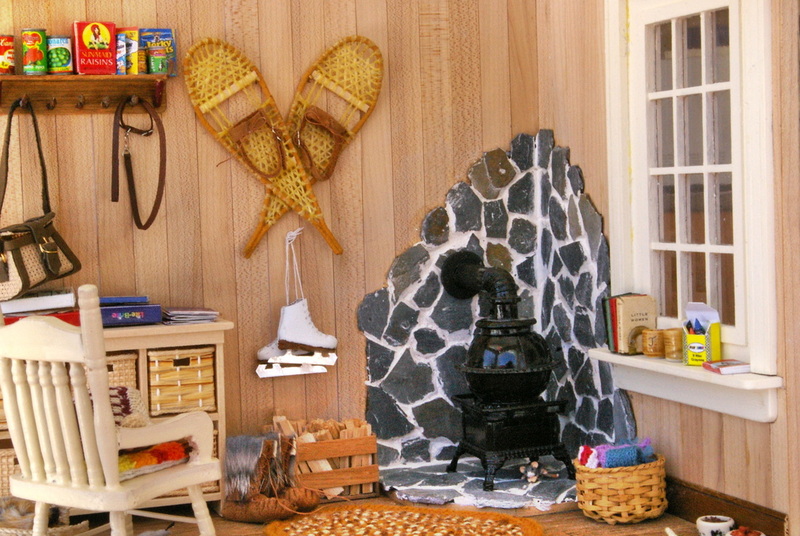 As a child, milk cartons, once the side was cut out and made into a second floor, became my dollhouse canvas. Used sewing spools became furniture and scraps from my mother's sewing basket became all manner of objects in miniature. Then I discovered balsa wood. My brother used to build model airplanes from balsa wood kits. One day, I took the scraps and built a chair out of them. I had to glue two pieces side by side to make a piece big enough for the seat but I made a pretty good rendition of a chair. Sadly, I didn't think to sand before staining and gluing so the finished piece still has the writing from the kit on it. I still have it and it's amazing it survived all the moves it went through. Fast forward to life after university and I got back into miniatures with a good heart. This time I was wiser and started using basswood--much better to work with. My biggest pleasure is taking a photograph of a piece of furniture I like and reproducing it into one inch scale as near as I can. I may make some modifications to suit what I like and what I can actually accomplish. I'd also been collecting small accessory items throughout university as my home province is somewhat short on dollhouse shops. Also after university, I took up pottery, a skill I'd always wanted to learn. After borrowing a book on miniature pottery from the library, I started making my own and haven't looked back since. Many people have favourite materials to work with but I enjoy trying so many new things that I don't think I have a favourite. There's always wood though I can't say I'm a pro at it. I seem to excel at the pottery and I'm starting to sell it online and at local shows (though those are few and far between). Thank goodness for the internet! And the other thing I like is leather, especially pertaining to horsey items. But that's for another time. Well, enough about me. I wanted to explain how I made the computer. I'm sure it could be done better for future ones if it comes to that but this worked for me. Most of the mini computers I found online were unlifelike or very old school. I wanted a modern desktop computer to replicate what my father has. It's for a Christmas present, but shhh... don't tell him! I happened to have some black Fimo on hand and it seemed the perfect colour and surface for a computer. I started with the mouse, which was the easiest. I rolled up a small ball of Fimo and pressed it down until it resembled a mouse. I then pressed a tiny black seed bead for the scroll wheel. Perfect! Then I flattened out Fimo for the keyboard, leaving out the keys for now. Then I made another flattened rectangle for the keys, pressed it onto the base and used a knife to score in the alphabet keys. I did the same for the number keys. I didn't get this quite right but maybe for next time as I had no room for any more keys. The CPU was also challenging. It's hard to get perfectly square corners when sculpting Fimo but I didn't want to use a different material because then they wouldn't match. I scored the front to simulate the drives and used no hole beads pressed into the clay to simulate buttons. For the webpage, I took a screenshot of the nasa.com site, brought it into Photoshop to size it down and printed it out. I sprayed the paper with clear acrylic spray to simulate a monitor screen, glued it onto the back part of the monitor and then glued the delicate front piece on. I then fitted the monitor onto its stand like a key in a lock. Glue holds it in place. Voila, I was fiinished. It may not be perfect but it's not bad and will serve my purpose.